Just wanted to share my experience renting the DVDs to John Woo's excellent Red Cliff bilogy. It is also a good opportunity to make known the importance of anamorphic DVDs. Back to Red Cliff: The movies are not really sequels, but two parts of an entire storyline. The movies were shown separately in the cinemas, and were also released in two separate DVDs. Red Cliff was a big hit in Asia, so it was a surprised to discover how poorly conceived one of the DVDs were. The subject in scrutiny is DVD Part I, which was not an anamorphic transfer, meaning that the the video was recorded as a 4:3 fullscreen video (a near perfect square, like what you see on free TV). This isn't an issue if the video was cropped to fit a fullscreen TV, but they used the widescreen format (a rectangle, like in the cinemas) and "squeezed" it into fullscreen. This means that on a classic, square TV, you will see the two black bars on the top and bottom of the screen instead of a video that fills the entire screen. Not much problem there. But on a widescreen TV, the picture looks overstretched width-wise. Worse, the black bars eats up screen and data space, reducing the picture quality of the actual video presentation. If you are not familiar with anamorphic transfers, there's a bit of a technical explanation to it, but essentially it's a recording technique that efficiently retains video quality of movies shot in widescreen format on DVDs. Most good original DVDs would indicate whether it's an anamorphic transfer at the back of their covers. 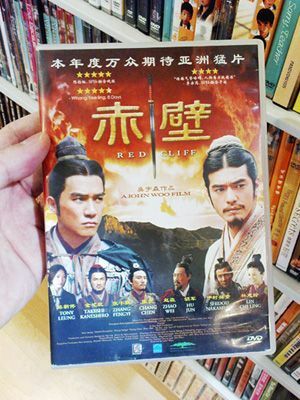 Red Cliff Part I DVD is not anamorphic, thus the video quality is glaringly low on a hi-definition LCD. Red Cliff Part 2 DVD is anamorphic, though, and the picture fits my LCD correctly. Picture quality is a lot better than Part I DVD, but then I noticed that the video seemed to have fine, horizontal "black stripes". I was about to blame the DVD again, until I read this article about video interlacing and progressive scan. Nevertheless, the video quality is still not to my satisfaction when compared to other original DVDs I owned. Bottom line: Don't buy Red Cliff Part I DVD (unless they release an anamorphic version), but Part II is ok, though you may see some interlacing issues if your player or TV isn't "progressive". Chim... The Red Cliff Blu-Rays are a better bet, but no comments on those until I finally get them. All the Red Cliff discs in Singapore are currently distributed by Scorpio East.